MMS AUGUST 2018 294 mmsonline.com IMTS 2018 Miscellaneous Equipment System Performs Ultrasonic Cleaning, Rinsing, Drying The Cube 2 is an automated, small-footprint parts-cleaning system from Miraclean that provides ultrasonic cleaning and rinsing as well as high-efficiency drying. The system promotes good particle count cleanliness levels, the company says. The system is equipped with two ultrasonic frequencies in the cleaning tank and additional ultrasonics in the immersion rinse to remove contaminants, such as buffing compounds, from com- plex part geometries. Vertical agitation and spray-off in the wet process stations provide additional mechanical action to slough off soils loosened by the ultrasonics. | Miraclean Ultrasonics East, Level 2, Booth 121015 Roof Bellow Features Double Fold, Clear Fold Material Hennig's Roof Protect machine roof bellow keep dust, particles and other debris from escaping or entering the roof of a machine. The bellow can be manufactured to any dimen- sion and is lightweight and portable. A double fold achieves the lowest possible com- pressed length. White, translucent fold material provides brightness in the working area. Two-ply, rigid polyester sheets with poly- urethane coat both sides. A decoupling option enables crane loading and unloading. The bellow has a tempera- ture resistance ranging from -30°C to 110°C (-22°F to 230°F). The maximum standard length ranges to 24 m (78.75 ft.), with custom lengths available for large applications. 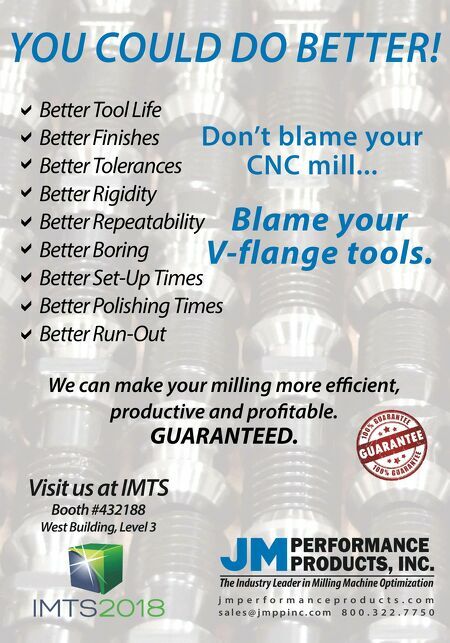 | Hennig Inc. | East, Level 2, Booth 121207 Come and see us at IMTS 2018 in Chicago (booth 431238) and find out why Synergy 735 is the clear choice for Titan Gilroy. 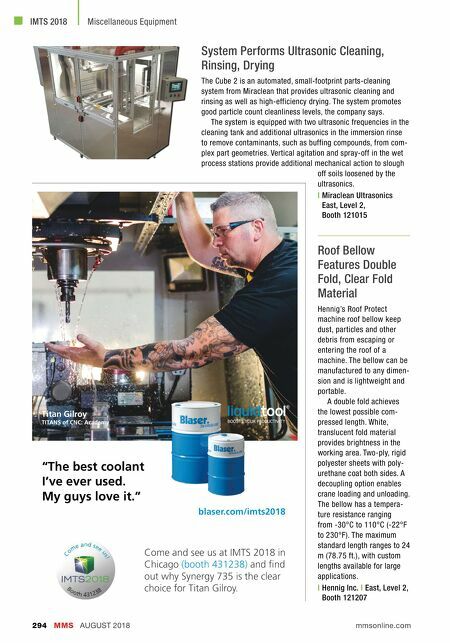 Titan Gilroy TITANS of CNC: Academy blaser.com/imts2018 "The best coolant I've ever used. My guys love it."